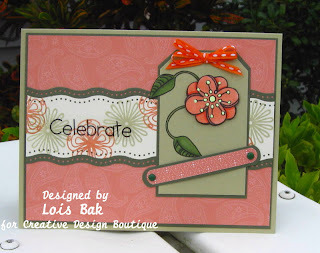 Faith (Markie's Mom) was the challenge hostess on the Stampin'B's Design Team challenge blog this week. She had me scrambling with another watercolor challenge. Actually, this is the second card I made for her challenge. I forgot to take a photo of the first one before I gave it to my sister for her birthday. Take two: – the image is a beautiful sunflower from Rubber Stampede, which I colored using watercolor crayons and an aquabrush. I still have a problem with the washed background. I’m going to have to work on that process! The Heidi Grace DP was just the right color to go with the Really Rust mat. The sentiment, from PTI’s Birthday Basics, is cut with one of the smaller dies in Spellbinders Labels Four set. I guess I should thank you, Faith, for making me work at a technique with which I struggle. Practice, practice, practice!!! 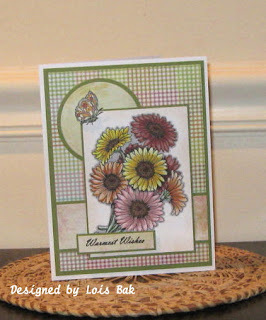 Joanne’s challenge on the Stampin'B's DT Challenge Blog made me scramble this week. I don’t have too many “humorous” stamps, so I had to wing this one. I think we could all relate to the sentiment on this Inky Antics stamp in one way or another – be it overeating or overspending or whatever. One way to eliminate reading about our vices definitely would be to give up books and magazines!! After stamping Sassy Suzie with Palette Noir Black and coloring her with Prismacolor and Copic markers, I cut out the panel with Nestabilities Label 4 and matted it in Pixie Pink. The DP is from a DCWV stack called The Sweet Stack, which seemed very appropriate with the sentiment. It’s hard to see in the photo, but the glittery brads sparkle in the light. How do you like that cupcake in the background? It’s foam rubber, and I found it in a great little gift shop near my favorite LSS in Mount Dora, Florida. 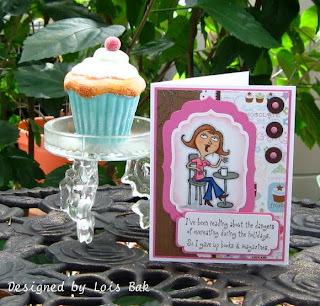 We have a winner of yesterday's Blog Hop! The Winner is..... Trina Parsons! Congrats, Trina! Please email mjh7433109@aol.com with your address so that we can send your NEW Floral Breeze Stamp Set to you! Due to some unforeseen circumstances, our Creative Design Boutique Blog Hop is a little late this month., But , as they say, “better late than never.” This month we are spotlighting the set Floral Breeze by Rita Marie and Company. And BLOG CANDY is involved!!! In looking for a layout, I went back to PageMaps and found this one, which was a little unusual – I liked the little “belt” across the main panel. I stamped one of the swirly flower images on a tag of SU River Rock, colored it with Prismacolor and Copic markers, and matted it with Always Artichoke. I stamped and colored a second image, cut out the flower, and popped it up on top of the first. I made my own DP for the horizontal panel using several of the smaller flowers in the set, stamping in both River Rock and Groovy Guava. I love these two SU In Colors from last year. The edges are cut with an EK Success border punch. For the background I chose Groovy Guava DSP, and the belt is held down with two small brads. The sentiment is a rub-on. All images may be found at Creative Design Boutique. Make sure you visit ALL of the blogs of the Creative Boutique design team, leave comments on ALL 6 of the Blog Posts; and a winner's name will be chosen from those posts on Thursday, September 17, and posted at 6 PM. You have to leave a comment on each blog to be eligible to win. Here are the links for the rest of the team! Good Luck! 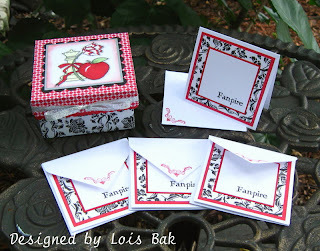 Labels: Blog Hop, Creative Design Boutique, Rita Marie and Co.
Nicole (ButterflyEars) was the challenge hostess this week on the Stampin'B's Design Team blog, and she had a fun challenge for us this week -- to make a 3 x 3 gift box and four matching cards. I had to check out the tutorial in the Resources section of Splitcoaststampers for the directions for a 3 x 3 box. Actually, I think my box came out around 3 1/4 x 3 1/4, but it was close enough. The base of the box itself is SU Basic Black, covered with some G*C*D Floral Garden DP I had left over from a previous Twilight project. The base of the lid is SU Real Red, covered with Real Red DSP. 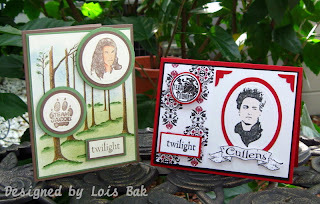 As a true Twilight fan, I had purchased the two Artful Inkables stamp sets inspired by the Twilight phenomenon – Into the Moonlight and Fictionally Inspired. The image on the box depicts the covers of all four books in the series. Those images appear singly on each one of the covers. I stamped it with Palette Noir Black and colored with Prismacolor and Copic markers, sponging around the edge with Real Red. I cut out the squares with Nestabilities and tied the silver ribbon around the lid. The four matching cards were quite simple – Flourishes Classic White, SU Real Red, and some more of the G*C*D Floral Garden DP. I had to make the envelopes using my Ultimate Crafters Companion Enveloper – what a great tool! I stamped the back of the envelope flaps with a small flourish from Swirly Q’s by Fiskars. I have already given this gift away to my daughter-in-law, another big Twilight fan. A quick posting today. 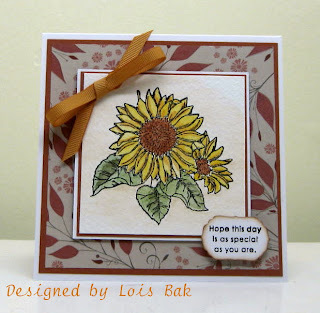 This week's Timeless Tuesday on the Flourishes Blog was a sketch designed by Cindy Haffner. I used my new Gerbera Daisies, stamped with Versafine Black Onyx and clear embossed. Then I colored the image with Prismacolor and Copic markers. All the DPs are from Basic Grey's Lemonade paper pad and the panels are matted in SU Old Olive. The sentiment is from Summer Blossoms, also clear embossed. It's a bit hard to see, but Apricot Appeal is stippled all around the outside edge of the main panel. After I had glued everything down, it looked a little low on the card base, so I added the butterfly to pull the eye up a little. Hope that worked! My friend Rosemary and I went to the movies last night. We saw "The Time Traveler's Wife," which we enjoyed quite a lot. We had arrived at the mall about 45 minutes early; so, after we bought our tickets, we wandered over to Barnes and Noble to see if they had any new Twilight stuff. Lo and behold, in among the books, calendars, key chains, etc., etc., what did we find? Rubber stamps!!! Who would have thought? Fortunately, there were two sets sitting on the counter. It might have gotten ugly if there had only been one set left. LOL!!! When I got home, I naturally had to play with them. There are two other Twilight fans in my office -- one a Team Jacob (as am I) and the other a Team Edward. Not to play favorites, I made a card for each of them. The background of the Team Jacob card is from Innovative Stamp Creations, which I colored with Prismacolor and Copic markers. I stamped Jacob, the wolf paw and the Twilight with Memento Rich Cocoa. The DP on the Team Edward card is some Deja Views paper I had left over from another Twilight project -- the colors are perfect. Edward is stamped in Memento Tuxedo Black; the Team Edward, Cullen banner and Twilight are stamped in Versafine Black Onyx and embossed with Clear ep. The small photo corners and mat are SU Real Red. If you're a Twilight fan, you should check out Twilight Tuesday. These cards are for their Challenge #45. Vicky’s challenge to make a card using Chocolate Chip, Close to Cocoa, Creamy Caramel, and any neutral came at the right time for me. My older son’s birthday was coming up, and I needed to make a birthday card for him. 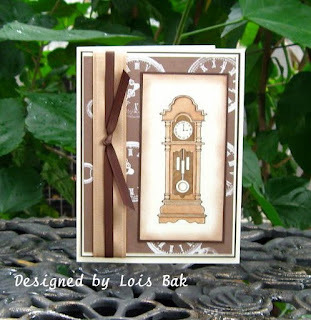 I chose the larger grandfather clock from Gina K. Designs’ set A Special Father for my main image. I stamped it in Palette Burnt Umber and colored it with Prismacolor and Copic markers. After sponging around the edges with Creamy Caramel, I matted the image in Chocolate Chip. The background was created by stamping a pocket watch image by Inkadinkadoo in Whisper White onto Close to Cocoa cardstock and embossing it. I added the wide satin caramel-colored ribbon and chocolate-colored grosgrain ribbon. 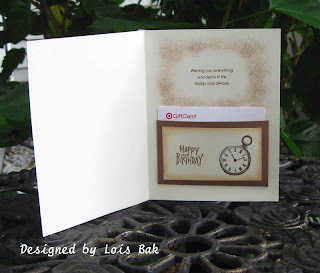 Inside the card is a Target gift card, tucked into a little pocket I created using Close to Cocoa and Very Vanilla – stamped with a greeting and another smaller pocketwatch. That small pocketwatch is actually part of a collage stamp by Inkadinkadoo. I just colored the watch portion with a brown marker and stamped it on the panel. I saw this really cool technique called Painting with Powder at a LSS in Mount Dora, Florida. Stampendous has a YouTube video on their website – you should check it out. I combined this technique with today’s Timeless Tuesday challenge on the Flourishes Newsletter – no coloring of images. 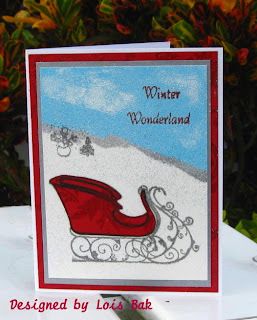 Following the directions on the Stampendous video, I created the background using embossing powder in blue; white; silver; and a mixed color called Winter Wonderland, which is silver and white combined. Then I stamped the sleigh and snowman/tree in Versafine Black Onyx ink and embossed in clear. The sentiment was stamped with Versamark and embossed in red. The body of the sleigh was stamped onto some glitter paper I bought last year from Flourishes, cut out and paper-pieced onto the image on the card. With all the sparkle from the embossing and DP, I didn’t think it needed any embellishments, so I just matted the picture in silver and more of the red glitter paper, and glued it down to the white base.